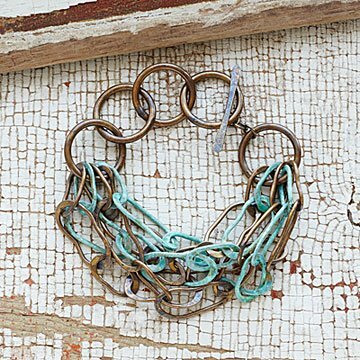 To make this chunky statement bracelet, she deftly shapes brass sheets into delicate chain links and then lets the magic of oxidation give select oval-shaped pieces a one-of-a-kind patina that varies in hue from dark umber to creamy sea green. To finish, she electroplates a handful of links with soft gold and copper for a pop of shimmer and sumptuousness. Handcrafted in Buenos Aires, Argentina. A birthday gift she loved! Gave this as a birthday gift. More beautiful then I could have imagined. The colors of the metals are so beautiful! It can be worn casual or dressy. Love the versatility of this bracelet. Adjustable and really unique! I reviewed the earrings I bought as well. I love the authenticity of this designer and my bracelet, earrings and necklace are quite versatile. I can wear when dressed down or up and with multiple combinations of outfits. I love it!!! More importantly, I will say again that I love the 'mission' of Uncommon Goods. Focusing on the 'Village' universal caring and giving back means a lot when I purchase from an organization.